On rare occasion, the silhouette of a dark angel with blackened wings can be seen in the sunset above Nio Kio City. That being is Serket. Attracted by the glowing, electric city Serket floats freely, unhindered by gravity. The rare appearances of this monster can send local tamers into a frenzy, causing them to scramble to reach one of the sky-scraping rooftops of Nio Kio for a chance to recruit the mysterious beast. Its natural habitat is entirely unknown. 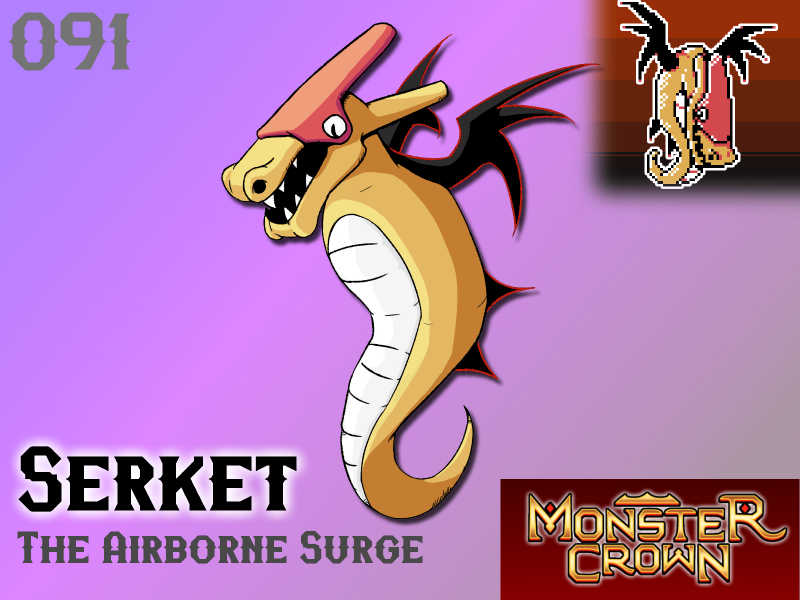 While Serket can appear quite unaware or confused with its unblinking gaze, the creature possesses formidable abilities. Serket's tongues act as an electrical ground, meaning that when its jaws are closed a high voltage current runs freely from its upper-jaw and into its mouth. As you can imagine, the implications of being bit by Serket can be severe. Serket's signature move, Surge Protect, activates a unique effect. Its magical attack power will be stuck in a loop between 1x and 1.5x. Any moves lowering its magical attack power will instead loop it back around to 1.5x, however, any moves buffing its magical attack power beyond 1.5x will loop it back around to 1x. Will Serket make your team? Hmm... curiosity... does his Electric Bite use his Magic Stat that Surge Protect is built around, or Physical Stat, suggesting Serket as a Mixed Sweeper...? Sounds an awful lot like Seycret... Are they related monsters? Hmm... Could make for an interesting Fusion...?